If youâ€™re in the area, KaalaChakra: The Wheel of Time is a current exhibition at the National Library of Singapore showcasing the influence of Indian culture into ancient Southeast Asia. With the kind permission of the National Library Board, SEAArch brings you highlights from this fascinating exhibition. 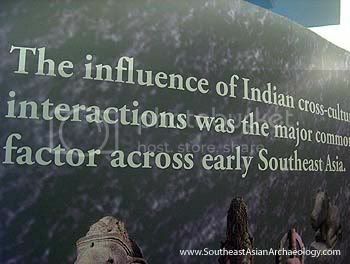 The term â€˜Indianizationâ€™ was coined in the early 20th century and was seen as a cultural colonization of Southeast Asia â€“ the idea was that Indian princes and merchants would set up colonies and trading posts in Southeast Asia (notably, Suvarnabhumi and Suvarnadvipa) in their desire to build trade with China. In doing so â€œconvertedâ€ local populations into their Indian way of life and religion. Yes, the theory sounds awfully colonial in its thinking, and it fed to another underlying assumption that Southeast Asia was an archaeological backwater compared to the great civilisations of India and China. Since then however, a more complex, nuanced picture has emerged. As archaeological research for the formation complex societies and polities grew, the evidence points to local cultures adopting and assimilating ideas from India to augment and reinforce existing structures of power. Rather than a one-way replacement of culture, local rulers chose to adopt Indic religions and selectively pick on aspects of this foreign, exotic culture to reinforce their prestige and drawing power as rulers. To that extent Hinduism proposed a world view order with the king-slash-god at the centre, while Buddhism placed the ruler as someone with superior merit and skill. KaalaChakra: The Wheel of Time quite nicely and concisely presents the evidence for the Indianization of Southeast Asia. Like the previous exhibition Aksara: Passage of Malay Scripts, this exhibition gathered some choice exhibits (although some of them replicas) loaned from museums in Indonesia, Thailand, Malaysia and the Netherlands under one roof. Iâ€™m particularly interested in rock art (what Iâ€™m working on for my MA research), so I was delighted to find examples of rock art of caves in Thailand featured here. 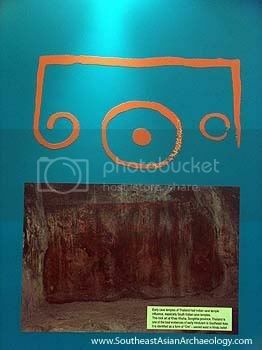 This one is a petroglyph of the universal sound â€œomâ€, found in a cave in the Songkhla province of Thailand. Itâ€™s date is unknown, but an educated guess would be the early centuries CE, particularly since it was a cave temple. The site is called Khao Khuha. Interestingly enough, I was told by the organiser of the exhibition surmised that the word, ‘Khuha’ sounds very much like the Tamil word for cave. 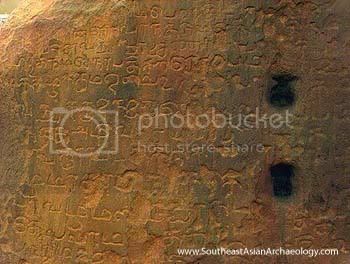 Speaking of languages, inscriptions are some of the earliest epigraphic sources of information about Southeast Asia. As Hinduism became the dominant religion among the ruling elite, Sanskrit, the classical language of Indic religions was used, along with Indian scripts that were adapted and evolved into local tongues today. There are also a few exhibits that have never been seen outside their home country, such as this inscription from Wat Pra Mahathat, from Nakhon Si Thammarat in Southern Thailand. (It’s the stone with the two holes on it.) The inscription, written in a Tamil-Grantha and an unknown, non-Indian script, it is as yet untranslated and the National Library is currently inviting researchers to study it. KaalaChakra: The Wheel of Time is on at the 10th floor of the Lee Kong Chian library at Victoria Street until May 2008. Special thanks to the National Library Board for the kind permission to take photographs of this exhibition. 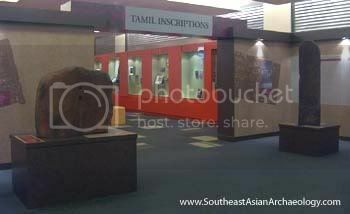 It is really nice to know about Tamil Inscriptions in SE Asia. Please do add the Tag /Category as Tamil to the blog .